Had to skip Jingle Cross this year. Not sure if it was the 6hour drive, hitting the road at 5am Saturday morning and getting home at Midnight Sunday, or the fighting for that last money-paying spot (25th) in the UCI Elite race. Maybe all the above! No Worries since there was a local race going on. Turnout was moderate since so many people made the trip to Iowa, but descent numbers considering the change in weather. 30 degrees and an inch of fresh snow made a most of the tight off-cambers turns un-ridable. The course was super fun and technical and required more finesse than pure horsepower. In fact, there were only a few sections that you could really put the power down without worrying about sliding off the course flat on your back. The course started uphill in a parking lot and quickly led into a long grass climb that was tough to ride as the race went on. I preferred to stay on bike and keep the bottom of my shoes that much cleaner. After preriding the course, I figured just keeping the pedals clear and getting clipped in and out would be the main issue. Once up the first climb we dropped back down across the road and hit a treacherous off-camber left with the double barries right after it. Back across the road up and short climb, then traverse across the hill and down a short hill. Then the fun really started. A tight right-hand turn led up a short run-up (ridable early in the day), followed by a run-down since right at the bottom, you made another hard right and back up. Shortly after this section was the days big head-ache. A steep run-up that was just straight up and slick. Had it not been for a few terraces cut into it by the race organizers, it would have been hard to get footing. The approach was all off-camber as well and it got really tore up, so you had to dismount a ways out. Once up and over this wall, was a tricky off-camber descent back onto the pavement for a short section then back on the grass for more tricky un-rideable turns then onto the paved start/finish area. There were only 4 of us signed up and only 3 made the start line. On the start line, they reduced our race from 60 to 45 minutes. I got the holeshot so I could pick my line up the first slippery hill. Once I got out front and got a gap on Andrew Coe (SKC), I just kept a steady pace and made sure I didn't make any major screw ups. It was usually faster to take the conservative approach rather than try something that could be faster but more often foolish. Each lap the bike got about 2 pounds heavier and the climbs that were rideable were becoming a less ridable. Surprisingly, my shifting, braking, and pedals worked perfectly for the whole race. Had we went the full 60 minutes, all 3 might have stopped working. I think I was having a little more fun out than than Andew was. This was more my kind of course than his. However, he can make me look silly on fast dry course. Shane Lee (Free State) held down the 3rd spot. We had an eventfull night of no sleep at Motel 6 that resulted in a full refund. The plan to get up early and race the Masters 40+ went out the window. Apparently Chris Locke can sleep through anything. I can't, resulting in a couple calls to the front desk and an imprint of my shoe on the ceiling. At least it was warmer than yesterday and a backwards course was still super fun and "flowy". Most of yesterdays cast of charactors stuck around for day 2, expect for Chris Wallace and Shadd Shreiner. The backwards course made for a longer paved start, with a kick into the wind right at the end before hitting the grass. Once onto the grass it was a series of short but steep climbs (that we came down yesterday) before the run-up. They altered the approach to the run-up to keep guys from riding up it. No way me and my 42*26 were going to make it anyway, but they added a little chicane at the bottom to really mess up most guys. After a little comic relief with a false start, we were off and sprinting. I tucked in behind Joe Smaltz and Bill Stolte. For the next lap or 2 , sat on the back of Joe and Bill. Bill would ride off and Joe would ease up (teammates just playing around), so I'd sit behind Joe, then it would come together and Joe would take off so i'd sit on Bill (this was only delaying the eneviteble obviously) . One time through the barriers, Nate Woodman bunny hopped them so fast that he passed both me and Bill in the process and went straight onto Joe's wheel. One back onto the long paved section. Bill was done messing around and sprinted by me up to Joe and the 2 Trek boys were off and running. I purposely didn't react to this move and eased up for Troy Krause and Darren Shlake. This course sucked if you were by yourself. Me, Troy, and Darren rode together for a couple laps, but Darren was riding the run-up and causing some major grief for me and Troy. A one second gap at the top would become a 2 or 3 second gap once we shot down the short single-track chute and back out into the flatter 2nd half of the course. We managed to close it down once or maybe twice but the elastic finally snapped and Darren was off and running solo in 3rd. Me and Troy stayed together for the last 1/2 of the race. Nate Woodman was behind us about 20 seconds or so and was doing a great job of holding the same gap lap after lap even with me and Troy sharing the work. We were still together on the bell lap and into the barriers for the last time. I needed to get over the barries first so I popped into the lead right before them. I think I got clipped in about 1 second faster than Troy and drilled it. I got to the short paved finish straight with just a second or 2 gap but just enough to avoid having him on my wheel for a sprint. 4th place and stoked again. Chilly temps and a late 4pm afternoon start time. I've always loved the course at Lincoln's Pioneer Park. Good flow and some descent climbing. Moderate turnout despite the close proximity to KC and a good payment both days. I've been making the drive up to the Nebraska races for 5 years. Great organization and atmosphere. With a few of the Trek HRRC boys out at the Night Bubba race in St' Louis, it was up to Bill Stolte and Joe Shmaltz(Trek/HRRC) to wave the red flag, and along withChris Wallace (KCCX) , they did. I got a great start, hitting the grass in 4th behind those three. Chris and Joe were 1 and 2 and pulling away. Bill was content to hold down 3rd and I stayed on his wheel. No reason for ME to chase down the 2 youngsters. The race was lining up behind us and I didn't want that so I pulled through breifly before we hit the road section. Once on the road I eased up and let Bill due some work. Cow Town's Shad Shreiner came through. After a couple laps, things settled in with Chris and Joe out front, with Bill Stolte and Shad Shreiner hooking together. I was joined by race organizer Troy Krause and we shared the work and eventually caught back up to Shad Shreiner. Bill Stolte was now by himself in 3rd and the 3 of us were making up some ground on him. Hitting the bell lap, the attention now shifted to how was I going to deal with Shad and Troy. Shad was riding the run-up, and was extremtly fast in the section right after it, so I knew better than to let him lead into that section. I led into that section with Shadd and Troy right behind. 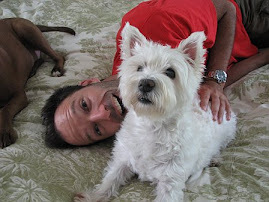 I took my time and made sure I nailed the dismount and ran at my own pace. Shadd ran right by me which I sort of expected, and immediately drilled it. It almost killed me to stay on his wheel over the next couple little kicker climbs before the road. At some point between the top of the run-up and the pavement, Troy dropped off the back of me. I'm sure working the race all morning was finally taking it's toll. I hit the pavement about 5o feet behind Shad and took 1 big effort to get back on his wheel. Once I got their, I had about 5 seconds to rest before I had to swing around on his left and got him in the last few meters for 4th. I normally don't sprint well so I was stoked with that. Lately, I haven't been able to "race" the whole 60 minutes so I was stoked to have down that. Race for 50 and ride in agony for 10 was what the previous race was. Tactically I think I did everything perfectly. It's now 5pm, sun is almost down, i'm soaking wet in a thin skinsuit, and it feels like it's 30 degrees. The plan was to to use the 40 minute Masters 35+ race to get warmed up and get the course dialed in. Things didn't go exactly that way. Great start and I was in the front group and we were pulling away, when I dropped my chain (yes, again). Put it back on and dug deep for the entire next lap to get back into the lead group. Then it happened again, in the exact same turn, exact same bump. Those of you that read my blog know that i've been haunted by this stupid little problem all season. Everybody within a 100 feet heard the R-Rated expletive and saw the equally stupid bike throw. I was done! Pissed off and in no mood to continue. Had a cooler head prevailed, I could have put the chain back on, road to the pit, and finished the race on my pit bike and still made the podium. Well, the cooler head did not prevail. I spent the next 30 minutes trying to get the problem diagnosed. The chain on my race bike was a bit ragged so I elected to put my race wheels on my pit bike and use that for the 1/2/3 race. That race went rather drama free for the most part. Still don't have a whole lot of power in the legs so I finished up mid-pack somewhere. Ironically, Troy Krause dropped his chain in the same turn, same bump that I did. That was just the start of his issues. He flatted somewhere and had to run a good half-lap or so to get to his pit bike, and STILL almost caught me. Brian Jenson and Shadd Smith were glued together the whole race and sprinted out the finish, with Shadd winning by a bike length. Next up is Nebraska. Yes, I will have a new chain on. Finished 10th. Fairly chilly out. Good start behind Shadd Smith, Bill Marshall, and Chris Wallace, and Brian Jenson. 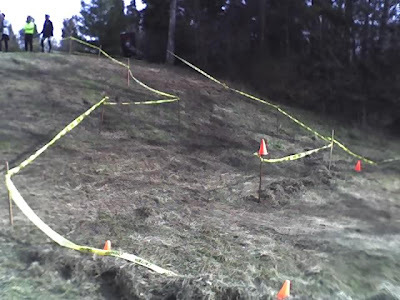 The course was super fast and had no shortage of traction anywhere. Race stayed together for the first couple laps. I didn't have the legs to stay on this train of guys so I backed off and let some guys come up. Adam Mills and Cameron Chambers came up and eventually went by and kept on going. They got a small lead and it just stayed there. Troy Krause joined me and we worked together for a few laps. Coming up behind us was Tom Price and Andrew Coe. Tom was with me earlier in the race but faded back for a while. Now he and Andrew were coming. Troy put in a little surge with a few laps to go and I was started to get cooked. I couldn't hold off Andrew and Tom. Behind me it was a tight battle between Shad Schreiner and Aaron Elwell that went all the way to the line. Can't complain with my effort. I lost 3 spots in the closing laps so maybe I can work on that but other than that, I did the best I could with the legs I brought. With the time change, my already-small amount of training just gets that much smaller. Let's see if "less is more" really works. I knew I was a few pounds over my normal race weight but it turns out to be about 6 pounds. That easier mtb program over the summer is coming back to haunt me! Another rather un-seasonably warm day here in KC and bone dry. Course featured quite a bit of elevation gain, but nothing very steep, and plenty of off-cambers turns on the way down. These will be a handfull should the course be wet in December. All the usual suspects on hand: Steve Tilford, Brian Jenson, Shadd Smith, Bill Stole, Joe Schmalz, Chris Wallace, Bill Marshall, Adam Mills, ect ect. After a couple minute delay at the start while Bill Marshall and the race referree had an entertaining discussion, we were off. 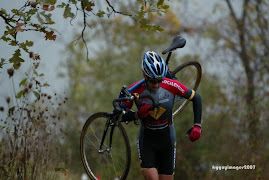 I slotted in behind the Trek/HRRC train leading into the grass. Tilford, Shadd, and Brian went off the front fairly quick but the rest of us managed to stay close for a lap or 2. Eventually Jeff Winkler, Joe Schmalz, and Chris Wallace (he's about 1/3 my age) moved in front of me and kept going. I got locked into a tight battle with Bill Marshall, Nate Woodman, Andrew Coe, and Graham Aldredge, and Tom Price. Graham pulled away (he's less than 1/2 my age). I lost contact when I chain dropped going over the barriers and got nice and stuck on the wrong side of the Third Eye. I ran the same set-up for 2 years and never had this happen, but this year it's been an on-going problem. I fought back and got by Nate and Tom (with a little help from his own mechanical). I was making up some ground on Bill Marshall and Andrew Coe but the heat and effort eventually flat-lined my effort. At that point I was just trying to keep Nate behind me. I was still happy with the effort since I was able to race the whole race and never really blew up. Need to fix the chain problem. When I dismount and hop the barriers, the cranks sometimes spin backwards just a little bit. When this happens, nad the bike is at at angle, the chain rolls off the ring from the bottom and then gets down in where the inner chain ring should be. It stays on at the top where the Third Eye Chain Catcher is, but if you try to pedal it back on, the tabs on the crank arm that support the inner ring hook the chain and drag it right into the chain stay. If I grind these tabs off, that should help. How do Cat 4's get into a 1/2/3 race anyway?